Mount Kilimanjaro has been called “The Shining Mountain.” Some scientists say Kilimanjaro’s peak may soon shine no more. 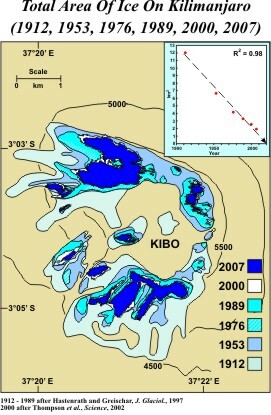 According to Professor Lonnie Thompson, Ohio State University, Kilimanjaro’s ice fields could be gone by the year 2020. 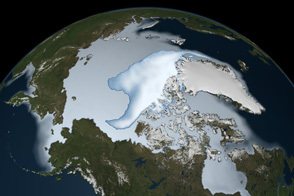 In his October 18, 2002, article in the journal Science, Thompson and his co-authors note that the ice on the summit, which formed more than 11,000 years ago, has dwindled by 82 percent over the past century. The authors note that the recent, dramatic decline in Kilimanjaro’s ice cap is particularly remarkable given its persistence through many previous shifts in climate, including a severe 300-year-long drought that impacted human populations living in the area about 4,000 years ago. The images above show two perspective views of Mt. 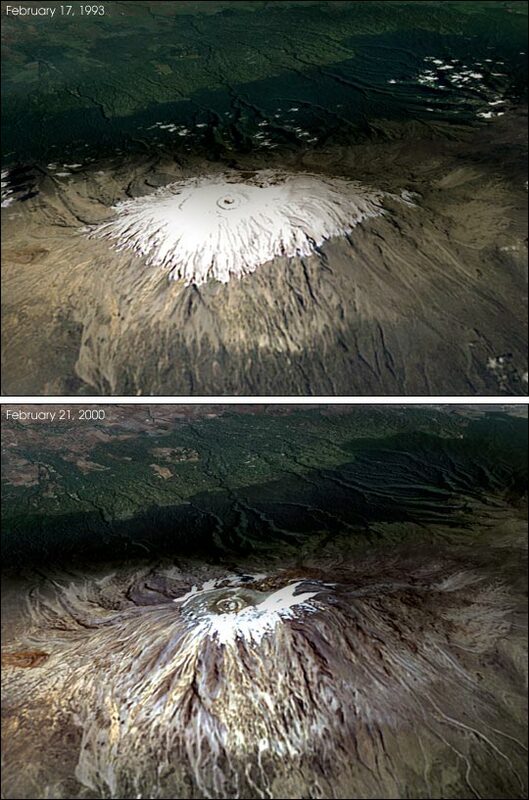 Kilimanjaro on Feb. 17, 1993 (top), and on Feb. 21, 2000 (bottom). 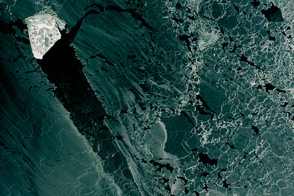 These images were acquired by the Landsat 5 and Landsat 7 satellites, respectively. 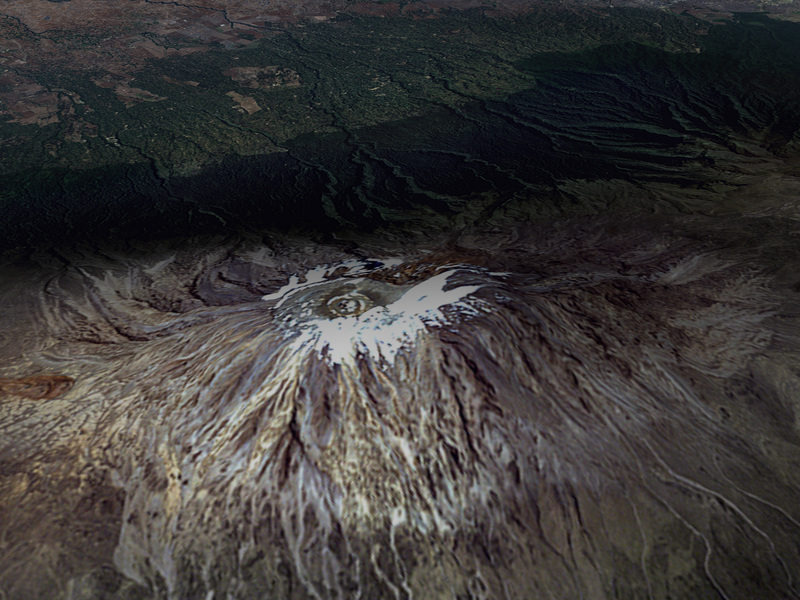 The scenes show heavily vegetated terrain (green colors) around the foot of Kilimanjaro, while the vegetation is relatively sparse up the flanks of the 5,895-meter-tall (19,335-foot) stratovolcano. 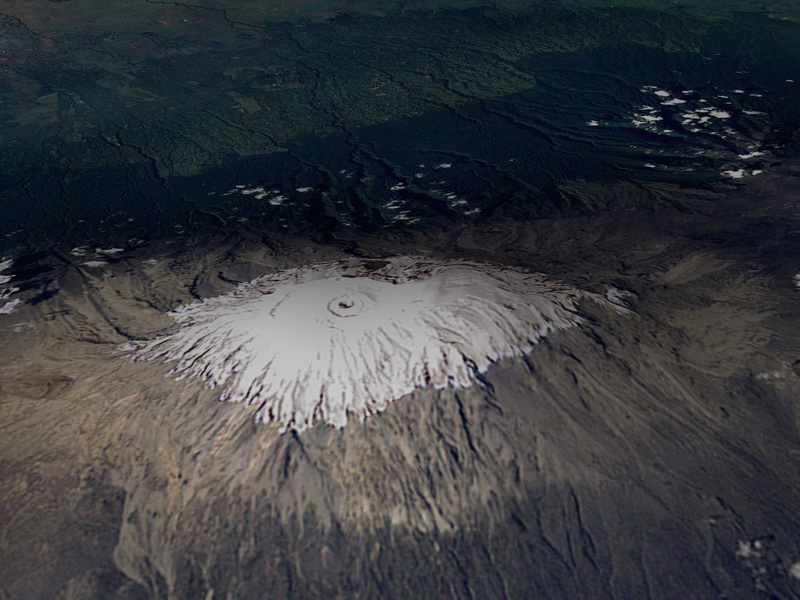 The light browns at higher elevations show mostly rock and bare land surface, revealing the crisscrossing drainage patterns etched into Kilimanjaro’s face over the millennia by rain and snowmelt. Here, the images have been draped over a digital elevation model to give a better sense of the mountain’s three-dimensional shape. It should be noted that the differences in the summit’s appearance in these scenes are due in large part to seasonal variations in snow cover. It is not possible to distinguish seasonal snow from ice in these images, so they cannot be used as an indication of the rate of the loss of ice. The earliest well-documented map of the ice fields atop Kilimanjaro was made in 1912. 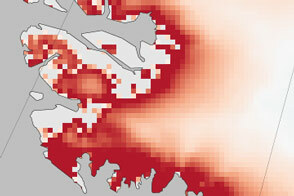 At least four surveys made since 1912 reveal there has been an ongoing decline in the extent of the ice. For more details, please see Tanzania - Mt. 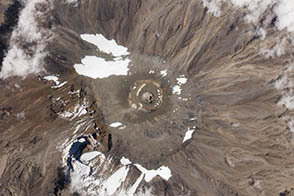 Kilimanjaro (2000). Courtesy of Lonnie Thompson and Ellen Mosley-Thompson, here is a recent color-coded map of the decline Kilimanjaro’s ice cap.